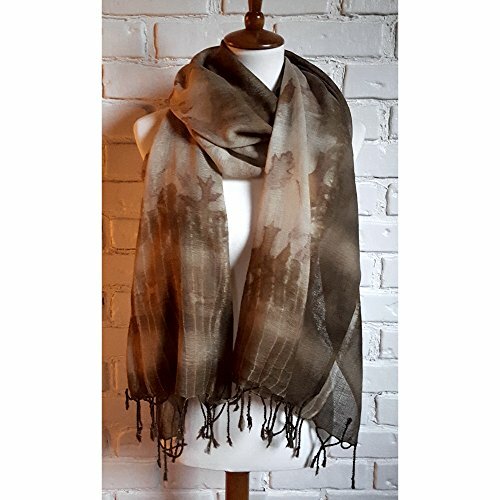 This one of a kind wool scarf has been dyed with black walnut and printed with the natural pigments of real oak leaves in a time consuming, but environmentally friendly process known as "eco printing" or "botanical dyeing." No synthetic inks, dyes or pigments are used. You can learn more about my eco printing process here: https://www.cedardellforestfarm.com/eco-printing/ Real leaves are gathered and bundled with the fabric making each scarf completely one of a kind. This wool scarf has been printed with red oak leaves that fade into the borders that are dyed a rich, variegated brown by black walnuts. The front and back of oak leaves leave very different prints,, resulting in some that are golden-brown and others that are much lighter. The fabric is bundled tightly with the leaves and tied with string, which created a resist for the black walnut dye. You can see the effect of this in the narrow vertical stripes along both short edges of the scarf. The fabric is soft and light with a loose weave. It is generously sized and can be spread out and worn as a shawl or scrunched up and worn as a scarf. It is easily long enough to wrap around your neck several times. You will receive the exact scarf shown in the photos. Size: 23" X 84" inches, excluding fringe (58.5 X 213 cm) Materials: 100% wool Care & Handling: - Gently hand wash ONLY, cold wash. - Use mild soaps. - No tumble dry. Hang or lay flat to dry. - Do not dry clean. Eco-Printing requires the application of heat and pressure to fabric, often resulting in a more textured appearance of the fabric. While small wrinkles in the fabric may ease over time, they are a semi-permanent feature of the eco-printing process. If you have any questions about this product by Cedar Dell Forest Farm, contact us by completing and submitting the form below. If you are looking for a specif part number, please include it with your message.